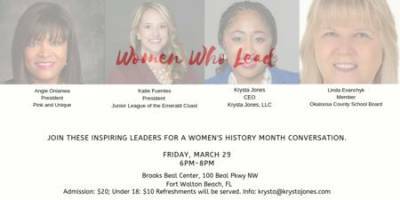 Join us as we network and learn from amazing women leaders. Moderated by Krysta Jones, 1996 CHS graduate and founder and CEO of Vote Lead Impact, panelists include Linda Evanchyk, Member, Okaloosa County School Board; Katie Fuentes, President, Junior League of the Emerald Coast; and Angie Onianwa, President, Pink and Unique. General admission is USD 20 (USD 10 for those under 18).